In general, off-host backup for VMs on SMB3 shares is similar to off-host backup of VMs on local storage or CSV. During off-host backup, Microsoft VSS processing operations are shifted from the source host to a dedicated machine — off-host backup proxy. The Veeam Data Mover is deployed on the off-host backup proxy, instead of the source host. You must configure an off-host backup proxy. For more information, see Off-Host Backup Proxy. In the properties of a backup or replication job, you must select the off-host backup method and off-host backup proxy that you want to use. If necessary, you can point the job to a specific off-host backup proxy. For more information, see Configuring Advanced Options for Off-Host Backup Proxies. The Local System account of the off-host backup proxy must have full access permissions on the SMB3 file share. The off-host backup proxy must be located in the same domain where the SMB3 server resides. Alternatively, the domain where the SMB3 server resides must be trusted by the domain in which the off-host backup proxy is located. Veeam Backup & Replication triggers a shadow copy of the necessary file share. Microsoft VSS components invoked on the source host and SMB3 server create a shadow copy of the volume on which the requested file share is located, and expose the shadow copy as a file share on the SMB3 server. 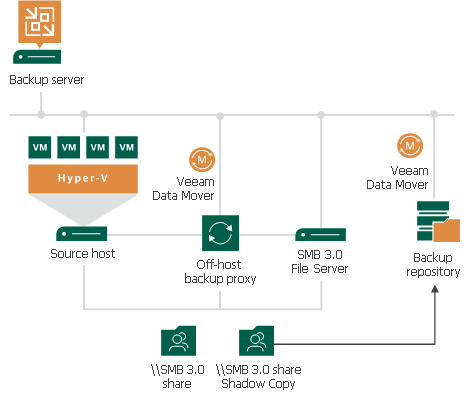 The Veeam Data Mover on the off-host backup proxy accesses the shadow copy on the SMB3 server. It retrieves VM data from the shadow copy, processes it and copies data to the destination. After the backup process is complete, the shadow copy is deleted.